“Deliverables of Dynamic Diagnostics” Webinar Series for Secondary Math Educators: We live in a world of data…but do we always use it and use it effectively? As educators, data informs our practice but we are often plagued with the task of how to manage it, review it, and break it down. Leaving us to ask how does diagnostic data support us? This four-week webinar series is catered specifically to the needs of intermediate math educators and the unique transitional challenges that they are guiding students through from Grades 7-10. We will explore the use of diagnostics and what revelations they can lead to in our classes. We will examine premade and formal diagnostics and discuss the features that allow for analysis. Taking a student data-driven approach to support learners, this series will explore ways to ensure gains in student understanding and mathematical thinking – helping educators to have the greatest impact on student achievement. All shared ready-made and user-friendly curricular materials, lesson plans, videos, resources, and activities will be curated and tailored based on feedback/questions/curiosities from participants and PD groups across Canada. The “Deliverables of Dynamic Diagnostics” webinar series will be as follows: Webinar 1: “The Purpose and Power of Diagnostics” Strategies and resources to support selection and use of diagnostics and the collected student data. Webinar 2: “We have the data. So…what now?” Strategies and resources to support the use of student data collected from a diagnostic to enrich both teaching and learning throughout the semester. Webinar 3: “Stuck in the middle…of the semester” Strategies and resources to support the continued use of student data throughout the semester and overcoming data overload and performance underwhelming. Webinar 4: “Life is a cycle, a research cycle, and we’re going to dissect it all night long” Strategies for discussing growth in student understanding and thinking. The webinars will be structured in small repeated cycles as follows: • Presentation of Content: Presented material on part of the topic. • Community Check-ins: Opportunity for each participant or group’s thinking and questions on the topic and how it relates to happenings in class from the past semester or the current one. What challenges and barriers exist and how can we brake them down to support student learning? • Weekly commitment: Commitment to the group to try one thing from the discussions or presented material each week. • End of evening reflection: Reflection question to consider over the next week. 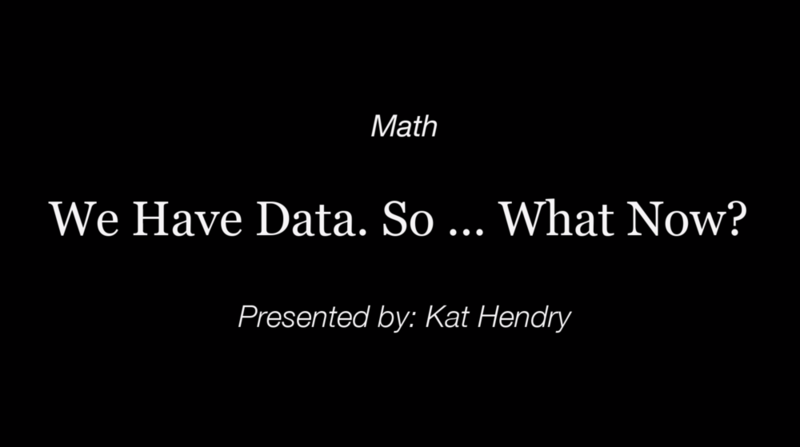 Kat Hendry is a Mathematics Educator that believes learning mathematics effectively has the power to empower students, families, and whole communities. Kat is currently a School Based Math Facilitator for the Limestone District School Board in Kingston, ON. She has taught both internationally and in Ontario as well as across grade levels and into post - secondary programs at St. Lawrence College and Queen’s University. Her background in Grounded Theory research has supported her work in classrooms by taking the approach of getting to know the student through many data points to support their learning. Kat continues to share her passion for learning and math education not only in the classroom but also through student enrichment opportunities such as the Math OlymPIcs, presenting at conferences (OAME, OTF, MADPD, Meeting the Needs, etc. ), reviewing articles for the OAME Gazette, and of course on Twitter! Kat’s greatest joy is her family whom thankfully understand her passion for math education and even exude some of their own. Although Kat dedicates much of her time to her work and family, she loves to dive into a good book, cook, bake, and when the opportunity arises paint – be it on canvas or house, the relaxation is the same! “Deliverables of Dynamic Diagnostics” Webinar Series for Secondary Math Educators: We live in a world of data…but do we always use it and use it effectively? As educators, data informs our practice but we are often plagued with the task of how to manage it, review it, and break it down. Leaving us to ask how does diagnostic data support us? This four-week webinar series is catered specifically to the needs of intermediate math educators and the unique transitional challenges that they are guiding students through from Grades 7-10. We will explore the use of diagnostics and what revelations they can lead to in our classes. We will examine premade and formal diagnostics and discuss the features that allow for analysis. Taking a student data-driven approach to support learners, this series will explore ways to ensure gains in student understanding and mathematical thinking – helping educators to have the greatest impact on student achievement. All shared ready-made and user-friendly curricular materials, lesson plans, videos, resources, and activities will be curated and tailored based on feedback/questions/curiosities from participants and PD groups across Canada. The “Deliverables of Dynamic Diagnostics” webinar series will be as follows: Webinar 1: “The Purpose and Power of Diagnostics” Strategies and resources to support selection and use of diagnostics and the collected student data. Webinar 2: “We have the data. So…what now?” Strategies and resources to support the use of student data collected from a diagnostic to enrich both teaching and learning throughout the semester. Webinar 3: “Stuck in the middle…of the semester” Strategies and resources to support the continued use of student data throughout the semester and overcoming data overload and performance underwhelming. Webinar 4: “Life is a cycle, a research cycle, and we’re going to dissect it all night long” Strategies for discussing growth in student understanding and thinking. The webinars will be structured in small repeated cycles as follows: •	Presentation of Content: Presented material on part of the topic. •	Community Check-ins: Opportunity for each participant or group’s thinking and questions on the topic and how it relates to happenings in class from the past semester or the current one. What challenges and barriers exist and how can we brake them down to support student learning? •	Weekly commitment: Commitment to the group to try one thing from the discussions or presented material each week. •	End of evening reflection: Reflection question to consider over the next week. We live in a world of data…but do we always use it and use it effectively? As educators, data informs our practice but we are often plagued with the task of how to manage it, review it, and break it down. Leaving us to ask how does diagnostic data support us? This four-week webinar series is catered specifically to the needs of intermediate math educators and the unique transitional challenges that they are guiding students through from Grades 7-10. We will explore the use of diagnostics and what revelations they can lead to in our classes. We will examine premade and formal diagnostics and discuss the features that allow for analysis. Taking a student data-driven approach to support learners, this series will explore ways to ensure gains in student understanding and mathematical thinking – helping educators to have the greatest impact on student achievement. All shared ready-made and user-friendly curricular materials, lesson plans, videos, resources, and activities will be curated and tailored based on feedback/questions/curiosities from participants and PD groups across Canada. Strategies and resources to support selection and use of diagnostics and the collected student data. Webinar 2: “We have the data. So…what now?” Strategies and resources to support the use of student data collected from a diagnostic to enrich both teaching and learning throughout the semester. Webinar 3: “Stuck in the middle…of the semester” Strategies and resources to support the continued use of student data throughout the semester and overcoming data overload and performance underwhelming. Webinar 4: “Life is a cycle, a research cycle, and we’re going to dissect it all night long” Strategies for discussing growth in student understanding and thinking. • Presentation of Content: Presented material on part of the topic. • Community Check-ins: Opportunity for each participant or group’s thinking and questions on the topic and how it relates to happenings in class from the past semester or the current one. What challenges and barriers exist and how can we brake them down to support student learning? • Weekly commitment: Commitment to the group to try one thing from the discussions or presented material each week. • End of evening reflection: Reflection question to consider over the next week. Now that we have data from our diagnostics, what do we do now? How do we use this data in a way that benefits my teaching and student learning? Making a plan for assessment over the semester to maximize data use. Reflecting on: How might starting with student data impact how my instructional and assessment practices over the semester? How do I know students are meeting their learning goals since I took the diagnostic?